Lately, at our Dickensian flea market, there’s been a man with a table full of books about ancient Egypt. He’s got books on history, on art, on myth, on language. It’s a full collection, somebody’s entire library. I wonder how it all ended up here. I imagine a Tintin character, a scholar with a long white beard and round glasses, an Egyptologist, who gives it all up, sells all his books, and goes on an adventurous journey down the Nile. I bought a beautiful book called The Literature of Ancient Egypt. I will freely admit to you that I didn’t even know such a thing existed. Of course I knew about the myths and the gods, but I didn’t know there were stories and poems, that we could still read lengthy narratives from all those years ago. And how strange and beautiful they are! They alternate between the completely human and recognizable and the fantastically bizarre. There’s a ghost story that isn’t spooky at all because “death for a deceased Egyptian who had undergone the rites ofbeatification was an extension of life…and rapport between the living and the dead was by no means always a gloomy affair.” There’s The Shipwrecked Sailor, which is a story within a story within a story, one of them told by a golden snake. day breaks, which way are you going? must you so scold me? I found my lover on his bed and my heart was sweet to excess. and I shall stroll with you in every favorite place. and he does not break my heart. with flowers and every sweet-smelling grass. with your hand in my hand. Many of the passages dole out advice, mostly to sons, some from fathers who are already dead. My favorite is The Maxims of Ptahhotpe. He’s not yet dead, but he’s aging, which he describes in a Sappho-worthy passage. It’s so strange to read words from an almost incomprehensible time ago, when it’s hard to imagine how people lived, and find truth in them that still resonates today. I’m not always the biggest fan of human beings in general, but sometimes in the bright round mystery of our history, we’re remarkable and beautiful and persistently true. We have so many herbs growing in our garden! I love this time of year. I love the bright taste of all of the herbs mingled together with something milder like eggs or cheese or potatoes. This turned out really good, I think. I used chervil and tarragon, which are both lovely and lemony and anise-y, plus basil and thyme, and sage and rosemary, and a little oregano. You can use whatever you have. I think the idea is to use strong flavors you might not usually combine, but which work well together because they’re all growing together at the same time. Very simple tart, in many ways, so it compliments the complexity of the herbs. You could play around endlessly with this! Here’s a song by Oum Kalthoum. Another thing I don’t understand completely, but find beautiful. In a large bowl, combine the yeast, sugar, and warm water. Leave for ten or fifteen minutes until it’s frothy. Add the olive oil, and then the flour, salt and pepper. Mix well, add more water or flour if necessary to make a kneadable dough. Knead for about five minutes. Place in a lightly oiled bowl and cover with a damp cloth. Leave in a warm place for a few hours. 1 cup grated cheese. I used a combination of mozzarella and sharp cheddar, but use what you like! a mix of herbs, about 1 cup loosely packed, cleaned and trimmed. I used chervil, tarragon, sage, rosemary, lemon thyme, oregano and basil, but you can use whatever is growing in your garden. In a food processor or blender combine the eggs, milk, nuts and cheese and blend until well-combined and fairly smooth. Add the herbs and lemon juice, the salt and pepper, and process briefly, just to combine and chop the herbs a little. You don’t want to completely purée them. Preheat the oven to 425. Lightly oil a cake or tart pan. Press the dough into the pan to form a thin crust, and press it up the sides. It doesn’t need to be perfect. Bake for about five minutes, just till it loses its shine. Pour the batter into the shell, and sprinkle the top with a small handful of pine nuts. Bake for about twenty minutes, until puffed and golden. Let sit for a minute or two, then slice and serve. 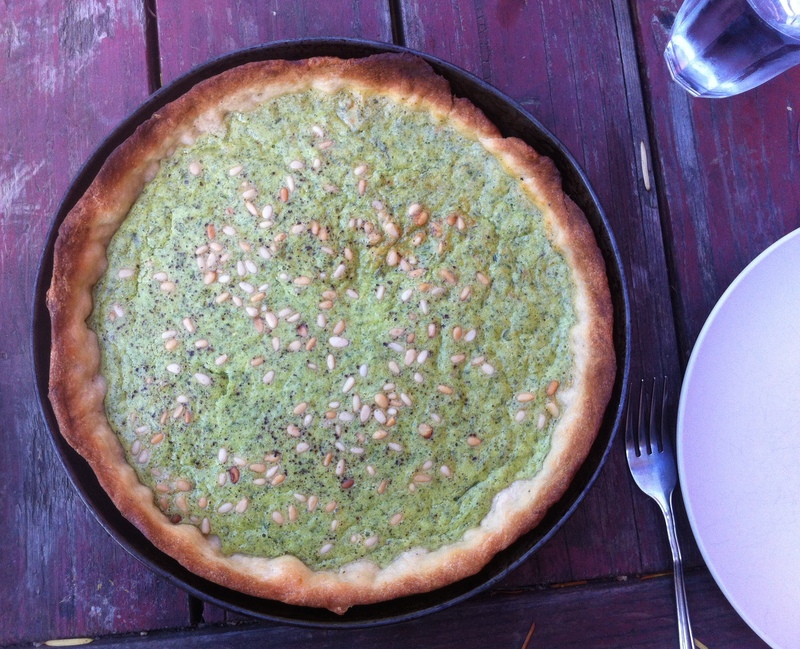 This entry was posted in basic pie filling, crust, pie, recipe, yeasted crust and tagged ancient egypt, herb tart, love poem by Claire. Bookmark the permalink.